Libby has lived all her life in Lavender Bay and whilst she has seen her friends go and gravitate back to the place she has no desire to leave it. Lavender Bay is her world and she is quite happy about that fact. However her friends, Eliza and Beth both have romance in their lives and this is something that perhaps if Libby admitted it to herself she craves as well. When Owen walks into the local pub and all of their lives, it seems that he is going to be a permanent feature in Lavender Bay. Owen and Libby seem to rub each other up the wrong way and you can see the sparks fly whenever they get into conversation with each other. But perhaps with them sparks comes a little flame of desire? That is if Libby can make up her mind what she wants – and also what she really wants to do with her life? Libby does not want to run the fish and chip shop – she has a fancy for cream teas and scones. Her dad thinks she should see some of the world when he retires and sells the fish and chip shop they run. Only trouble is that he hasn’t told her this…..so he goes ahead and sells the shop. Will the new owner of the fish and chip shop reveal their identity or will Libby carry on trying to create her dream life without knowing all the facts? This is the final part of the Lavender Bay trilogy and probably was my favourite of the three. It can easily be read as a standalone but if you do decide to read them all – in order then you will see how cleverly this novel has been almost woven on top of the previous two as you see things from Libby and Owen’s point of view. There is something about being taken to the seaside as winter comes in, as the tourists go home and only the hardy locals understand that community has to survive in all seasons. The snow (which is not really common by the beach I live by) adds an almost magical element to the story and gives it a real wintry feel. A great read for those cold wintry nights – even the warm ones too! Thank you to the publisher via netgalley for the opportunity to read this novel. 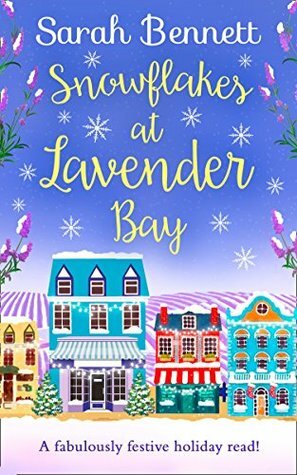 Snowflakes at Lavender Bay is published on 8 November.